Hello lovelies, so another new thing added to the blog but I thought it would be nice to end each month with a high if I can! So I thought I would share good things that happened on every day through out the month. 1. My alarm didn't go of so I had 20 minutes to feed and dress all three of us before the school run and face paint Oscar as it was world book day but got to the gate and everyone said how awesome Oscar looked so the massive rush was well worth it, I then took the kids to the park after school and we had lots of fun blowing gigantic bubbles, just shows you it doesn't cost a thing to have fun together. 2. I got chance to read some of my book! 3. Dan came home from work, my favourite time is when he comes back from working away, we had our favourite curry take away. 4. I didn't have to do the clean up at work which is always a joy and got to squeeze an hour nap in after work as I was pooped, I love an afternoon snooze. 5. We had a lovely family meal at a local restaurant of ours and the ice-cream after was delicious. 6. I took Lawson to a messy play run by one of my friends and he absolutely loved it, it was so nice to see him come out of his shell as he's so shy. 7. My nan treated us to breakfast then we enjoyed the sunshine whilst we had it after having so much rain. 8. Me, the mother in law and the kids went to a soft play and laughed so much, the slide there seemed like it had been rubbed with baby oil we all went flying down it, I nearly swore it scared me that much but was hilarious. 9. I felt happy to have Dan home early to have someone to cuddle up to at night. 10. Oscar was over the moon to have his friend over from school so that obviously made me happy. 11. Dan left for his skiing trip which is sad for me as I didn't get to see him but he was so sweet and got a surprise bunch of gorgeous flowers sent to my workplace for me bless him. 12. My mother in law made us a gorgeous Sunday dinner and my fiance face timed we through Whatsapp whilst he's in Austria, WhatsApp is such a great app and under appreciated I think, I can't believe it's free! 13. We became home owners! Plus the plans are going of to the council for our extension so very exciting! 15. The weather was absolutely gorgeous today so we enjoyed the sunshine and had an icecream in the park. 16. We had a home pj day, who doesn't love pj days? 17. Lovely day, in the morning me and Oscar had a play date at his friend from schools house we then had lunch at my mums then went to a soft play place with my mother in law and she cooked us tea. 18. My lover is back from is ski trip! He had an amazing time in Austria. 19. We had such a cosy family day, Dan did most of the jobs and we had a sofa film day was so nice. 20. Was the worst Monday ever but I got to take Lawson to work with me maybe a new career? 21. Oscar gave me his handmade mothers day card he made me at school and said some lovely things to me bless him. 22. Me and Lawson visited my dad and had a nice quick coffee with him and a catch up. 23. I had a lovely Mothers Day lunch with Oscar at his school it was so nice and I noticed a mum had to bring her baby in with her so I offered to look after him for her why she enjoyed her dinner with her daughter she was very thank full and happy so that made me feel good. 24. I got to meet Jemma (Dorkface) and we shared a hotel room and partied so hard at the Make Up Revolution party it was amazing! I got to see Charlotte, Rachel and some lovely faces and made new friends such as Millie and Fiona, everyone was so lovely and the party was awesome! 25. I watched Dan and Lawson in the garden they looked so sweet in there, Lawson was adorable helping put the stones in the bucket so we could sort our garden. 26. My mother in law spoiled me on mothers day as did my boys and nan, I had a wonderful morning and we all went to my mother in laws for tea and had a lovely family afternoon, it was so nice. 27. 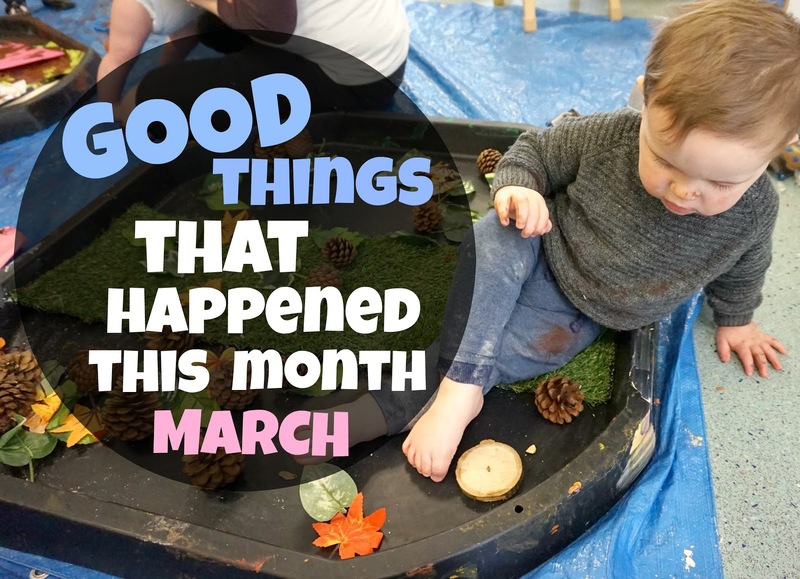 Me and Lawson had lots of fun at the Messy play group we go to and I help out at as it was Gruffalo theme then I picked Oscar up from school and the teacher said how happy she was with his reading! 28. My nan treated me and Lawson to breakfast then me and Lawson had a chilled afternoon before we had to pick Oscar up, when we did he got a sticker for being really good again with his learning, so proud of him! 29. Oscars got chicken pox bless him so we had a pj day, building dens and watching movies. 30. My mother in law dropped of some good lotion for Oscar and his pox and diet coke for me as I'm house bound bless her. 31. My mother in law has taken both children to hers so I can actually walk into town and get out of the house yay! SO lucky to have her. What things made you happy in March?